Just as in my last entry it is a song which inspired me to reflect upon the saints we are celebrating this week. While driving I heard a song on the Christian radio station which took me back to my days in high school choir. The song is called “Give Me Jesus” and is a somewhat modernized version of an old spiritual of the same name. In school we sang the traditional words which begin: “In the morning when I rise… give me Jesus.” There are three verses, all of which culminate with the line, “You may have all the rest. Give me Jesus.”* As I enjoyed the simplicity of the melody, I also thought about the lyrics and the persistence of the prayer to simply have (or be with) Jesus. If we have a relationship with Him we do not need to fear or worry because He will be there through everything. And in reflecting upon the lyrics I thought that when we sing such a song Jesus is probably simultaneously singing, replacing His name with ours. He wants us to be His, too. This is because everything He has done is out of His deep love for us. He loves us as we are, even with our imperfections. The saints responded to this love, as does anyone who is growing in relationship with Jesus. The more we fall in love with Him the more we allow Him to make us like Himself. All we need to do is seek Him and we will find that we are never alone. This week we celebrate the feast days of many well-known saints, beginning with one of my favorites, St. Teresa of Avila, or Teresa of Jesus as she was known in her religious community. St. Teresa was a woman who knew about love, growing from self-centeredness (too much love of self) to selflessness, (total love of the other) during the course of her life. Teresa began her religious life as a young woman of around 19 years of age. She entered the Carmelites simply because she did not feel like she wanted to be married and felt that this was the easiest choice for her. In 16th century Spain Teresa knew she could enter the convent and live a relatively easy life given that there would always be a roof over her head and a family around her. She was the ‘life of the party’ insofar as she was rather popular with outside visitors and was quite often in the parlor entertaining them. However, she also had rather lax prayer habits for one in religious life. After a series of mysterious illnesses, the most serious of which almost resulted in death, she began to rethink her attitude, which led to a very deep interior conversion. She realized through this process that she had lived in religious life for nearly 20 years and had done nothing to show her love and gratitude for all that Jesus had done for her and for the world. She was so horrified at this that she began to do penance and to change her prayer habits. The result of her experience is that she began to truly fall in love with Jesus, recognizing that His love was so great that she could only respond in love to Him. She grew in holiness and in prayer, such that she became a mystic and wrote many books for her sisters on the practice of prayer. She reformed the Carmelites, bringing about more depth in their prayer and community living. Interestingly, in religious life she was known as Sr. Teresa of Jesus; the name she chose when she entered truly became her identity. Indeed for her, the emphasis was on the latter part of her name. She was Teresa of Jesus, for Jesus, and in love with Jesus. 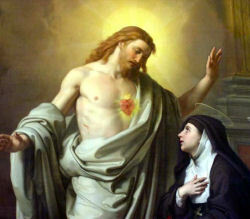 Another saint we celebrate this week is St. Margaret Mary Alacoque, who was the one to whom Jesus revealed His Sacred Heart in the 17th century. Like St. Teresa, when she was a young woman Margaret Mary also had a lengthy illness during which she developed deeper devotion to Jesus. Through her experience she grew to dearly love Jesus' presence in the Blessed Sacrament. Shortly after she returned to health she entered the convent. It was there that she had visions of Jesus over the space of about one and a half years in which He asked her to spread devotion to His Sacred Heart, and hence to the love which He has for all of us. St. Margaret Mary had much adversity to overcome in order to get her superiors to believe that she really had the visions, but with help from her spiritual director she was able to get affirmation of the validity of what she experienced. Most important, however, is that for her it was all about Jesus. All she really wanted was to share His love, because as those in love usually do, she wanted others to enjoy the same deep love she felt for Him and from Him. We also celebrate St. Luke the Evangelist this week. Luke was a convert from Greek paganism who came to devote his life to spreading the gospel. He was converted to the faith by none other than St. Paul, with whom he traveled until Paul's martyrdom. The love of Jesus was so important to Luke that love and its effects, especially joy and peace, are major themes of the gospel. He began by telling the love story of Mary and God, how God chose her from among all women and filled her womb with love beyond all telling. The love story continues as Luke told of the joy and peace that came to her, and which comes to all who allow the love of Jesus to transform their lives. Everything Luke wrote about in his gospel is centered on God's love which has burst into our lives through the giving of Jesus, who left us His love in the form of the Holy Spirit after He ascended to Heaven. Jesus was the center of Luke's life, just as He is the center of the life of every saint or holy one. For Luke, as for the others, it is not as important that we know of their love for Jesus, but that we know of His for us, and that we develop a close relationship with Him, too. This week the Sunday readings are about God's magnificent love for us. The reading from Isaiah is about the abundance with which God wants to shower us. On His holy mountain, Isaiah says, God will give us a banquet consisting of the abundance of His love. He will wipe away every tear and He will destroy death forever. (Isaiah 25:6-10) The Gospel contains a parable told by Jesus that is about the banquet to which we are invited in Heaven. All of the gifts we are given are because of God's overwhelming love for us; His love is so great He cannot contain it. He invites many into the feast, but some are not properly prepared and so they are not allowed to stay. They did not take His love seriously and did not live the gospel. Therefore they were not ready for the feast. That is, they did not learn how to love and did not love Jesus in the least of their brothers and sisters, so they were not able to receive the gift of coming to the banquet feast in Heaven. Jesus always made it clear that what we will be judged on is the quality of our love, and not on living the letter of the law or doing all the pious practices without caring for those around us, especially the least ones, (those in any way poor.) Luke pointed out in his gospel that Jesus had a special place in his heart for all the outcasts, knowing that His love was healing for them. Therefore if we are to be like Jesus, and if we want to be with Jesus, we need to find Him in ‘His most distressing disguise’ (as Blessed Teresa of Calcutta used to say) and love Him by loving them. St. Teresa of Avila reminds us in similar words that we are the only hands and feet that Jesus has now, so we need to be His love to His people. May we be inspired to seek Jesus in everything we do! May we call upon the Holy Spirit for an increase in faith, hope, and love! May we see Jesus in our brothers and sisters, especially those who are most in need! May we have hearts for greater love of Jesus so that we may grow in holiness! And may we know of the presence of Jesus in our own hearts so that we may come to know ever more clearly how much He loves us! Let us continue to meet in the Heart of Jesus! Peace! The photos are mine. The first one is a rock formation in an area in the Black Hills of South Dakota called the Needles. If you look closely you will see the heart shaped opening in the cleft of the rock. The final two photos are also mine. The first was taken on Copper Mountain in Colorado and the last was taken at Sylvan Lake in South Dakota.